Parkinson’s disease is one of the most common neurological conditions, estimated to affect around 250 people per 100 000 in the UK.1 People with Parkinson’s disease classically present with motor symptoms including bradykinesia, rigidity, rest tremor, and postural instability; however, non-motor symptoms may also be prominent, including depression, cognitive impairment, and autonomic disturbances. 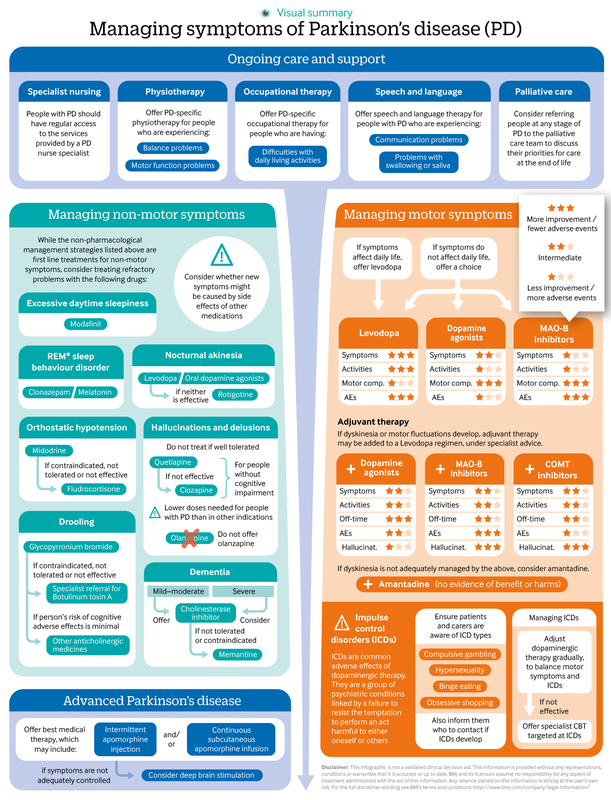 This article summarises the most recent update to the National Institute for Health and Care Excellence (NICE) guideline for the diagnosis and management of Parkinson’s disease in adults.2 This NICE guideline provides an update on most aspects of managing Parkinson’s disease, incorporating knowledge generated by a series of recent, large scale, independently funded, randomised trials in Parkinson’s therapy, and replaces guidance published in 2006. The update reflects emerging experience in areas such as impulse control disorders that may coexist with Parkinson’s disease and provides recommendations on the use of treatments that may provide some relief from the distressing symptoms of advanced Parkinson’s disease. The guideline update has not changed the suggested approach to the diagnosis of Parkinson’s disease, communication with people with Parkinson’s disease and their carers, pharmacological neuroprotective therapy, and interventions by Parkinson’s disease nurse specialists. Recommendations, full details of evidence, and the NICE pathway are available via the NICE website (www.nice.org.uk/guidance/ng71).